The Mayor of Casterbridge - After a pastoral laborer, in a drunken rage, sells his wife and child at a fair, he awakes the next morning, abhorred at what he has done.He swears off the drink and decides to make something of his life. The novel truly begins eighteen years later, when his wife and daughter come back to present themselves to him. 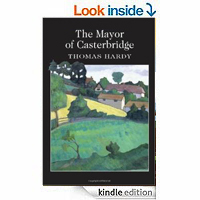 In the course of the rest of the novel, we witness the fall of the now Mayor of Casterbridge, brought about by his own character flaws and the interventions of fate.